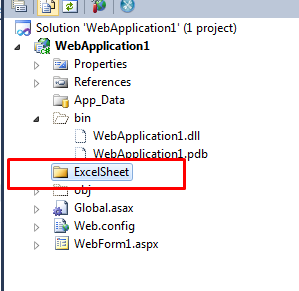 This article will show you to excel file upload or import and display in gridview using c# in asp.net. 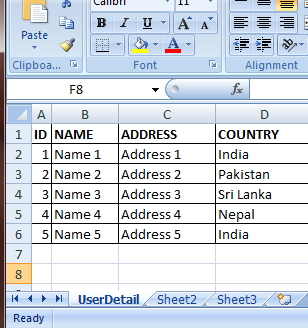 This article will show you how to read excel file in asp.net, show the import and display the excel data in gridview using c#. Some of my previous articles are as follows: Read List Of File From Server and Display In GridView Using C# In Asp.Net, How to Change DateTime Format Using C# In Asp.Net, Facebook like Button Integration In Asp.net Using C#.Net, Hide Or Show Gridview Row By Column Name at RunTime In Asp.Net Using C#.Net, Display Grand Total In Gridview Footer On RowDataBound In Asp.Net Using C#.Net, Detect Header Control and Assign Value of Gridview RowDataBound In Asp.Net Using C#.Net, Merge Footer or Apply ColumnSpan to Footer of GridView In Asp.Net Using C#.Net. First we will create a new excel sheet with some data. So for this article first I will create a new asp.net application and add the below code in your page. Now please check the code. Now in above code I have first read the file and saved in a folder and the I read the excel sheet and stored in dataset and bind it to the gridview control. Now we will create the folder. In this folder we will upload the file as shown in code.